The experimental and highly regarded Gifford Lectures at Edinburgh University was endowed in the late nineteenth century. Over the years, participants have including many leading representatives of religion, science, and philosophy. 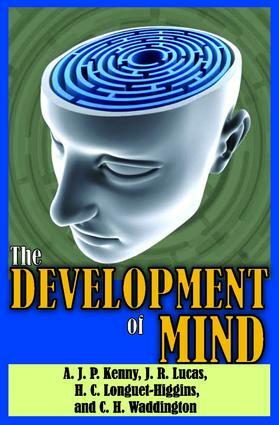 This series has as its subject, The Development of Mind. First published in 1972, the series continues to attract widespread interest. In this volume, contributors argue about the mind from diverse analytical standpoints.The focus of the series remains the relationship between religion, science, and philosophy. This volume attempts to achieve a comprehensive view of the subject of mind. The mental development of children in the light of modern psychology is discussed, and the distinction between "how" and "why" questions is put forward with clarity. The development of mind is further contrasted with the evolution of embryos in the young. The mind is considered as a capacity for intellectual activity, and as a multi-purpose program. Goal-directed behavior and language development are given importance, and issues of cosmic purpose, and the how and why of evolution, are never far from the surface of the argument.The lecturers know their opposition and their positions, and the cut-and-thrust of the discussion has much acumen and wit to it. Issues ranging from the impact of mind on theories of religion, causation, and rational will are examined in an informal, yet compelling, manner.